How many times have you scanned a QR code to only be redirected to the full blown website rather than a mobile website? Sometimes these websites have a ton of graphics, videos and sometimes even Flash on the page. Many companies feel they are on the cutting edge of marketing by using QR codes when in reality…they are not using QR codes correctly! Websites are optimized to be displayed nicely on a computer screen. They are built for monitors that are normally 15-20 inches in size. Taking one of these sites and scaling it down to fit on a mobile screen makes it hard on the user to read and find information. Many times, your users will have to zoom then scroll left, right, up and down to try and locate the information. Navigation is hard to do on a mobile device as well. Often, drop-down menus do not function since it is hard to hover with a touch screen phone. This often causes frustration as the user is sent to the wrong page. The other issue with navigation is when you try to touch a link. Many times, links are bunched together and trying to touch the right one does not work. You either get the link above or below it. While many phone networks are moving towards 4G connection speeds, many smartphone owners do not have a speedy connection all the time. This can mean your graphic intensive home page that loads quickly on someones home computer will not load quickly on their mobile device. If someone scans your QR code, they will not wait a long time for your page to load. A big one everyone knows about is Flash. Flash will not work on all mobile devices. Apple mobile products do not currently support Flash while older Android devices do not support full Flash. If your full website relies on Flash, that content will not be shown on most of the mobile devices coming to your page. You know what most visitors to your website are looking for. Make it easy for them to find this information. Your page should be simple and quick to navigate. Consider using large “touch friendly” buttons that lead the visitors directly to the content they are looking for. Your mobile friendly landing page should include a logo and then these simple navigation buttons. There is no need to publish all of the content on your website to your mobile website. This page should have a brief description rather than a long drawn out essay. 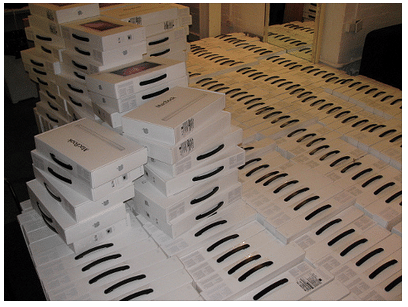 Many will be reading your site on the go and just want to find the info they need quickly. You should always provide a link back to your full site. This allows those that do want more info than what is on your mobile friendly website, they can visit the full site and find what they are looking for. Building your mobile website can be challenging. There are many options to building out a mobile website ranging from doing it yourself, hiring a web developer or using web based tools. If you plan on doing it yourself, be sure to take a look at jQuery Mobile. This is a version of jQuery that is optimized to create a mobile website that will look the same in all mobile browsers. jQuery Mobile brings in a lot of great features to create a unified UI that looks just like a native mobile app. There are tools that can assist you in creating a mobile website for your QR code. 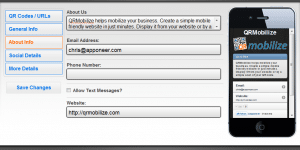 One of the mobile website building tools I use for all my QR codes is QRMobilize. This site is a free web based QR code generator that allows you to create a hosted mobile website for yourself or your company. They have a simple setup which walks you through the creation of a mobile website. Once your website is created, you can come back and change it whenever you need to without creating a new QR code. Visit QRMobilize and create your mobile website and share the URL below in the comments. 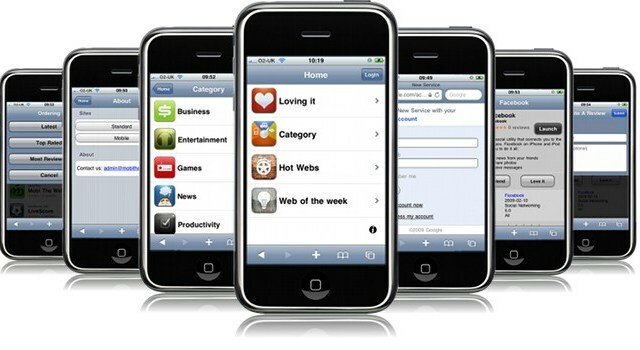 There are several other tools that can be used to create a mobile website that are both free, ad-based and paid. Just search around and let us know of any others you find. If you would rather save yourself all the hassel of building a mobile website, you can just have a mobile website design firm build your site. When choosing the right firm, be sure they understand what the point of a mobile website is and how to properly build one based off what you have learned in this article. In the past, I have worked with several firms. If you are unsure of someone to use, I would suggest giving Riptide Cloud a call. Riptide’s mobile website design services follow all the standards above and use HTML5 with JQuery Mobile to create amazing mobile website designs. In the comment section below, tell us what you use for your QR code marketing. Let us know what works and what does not work. Hi, I stumbled across the website. I was researching how to apply a QR code for potential employment. Any further assistance would be greatly appreciated. We are trying to run several QR code campaigns but our website’s mobile settings are overriding the QR code URL and sending the user to a mobile version of the site instead of the intended landing page. Is there any way around this? Funny that I’m reading this on my iPhone, yet your website isn’t mobile optimized. I’m surely the pot calling the kettle black, but that’s why I searched for your website! Lead by example. Thanks for the great article. I’ll check out QRmobile. Absolutely spot on with the article. In the case of our product (http://www.lynxto.com), it is in the pay for category, but it fits those who don’t want to mess with graphic design, bother customers with ads, and want to get up and running quickly without limits on views or bandwidth. We are using them now for all our mobile pages.